Does jnani know His prarabdha karma? Re: Does jnani know His prarabdha karma? As you mentioned prarabda karma is for body. Great saints have predicted about accidents, diseases and death of others-i e prarabda of others. As a corollary, they must also be knowing the karma which their own body must undergo. As for example, Sri Appaya Deekshatar was undergoing acute stomach pain, which he knew was his prarabda.. In order to do some pooja or important work, he wanted to remain free from the pangs of prarabda temporarily. So, with his spiritual power he transferred the prarabda of pain to a blade of grass. Immediately, the grass started shaking and tossing as if writhing in pain, till such time the great Deekshatar took back the prarbada karma. Pattinathar,a Jnani always carried a sugarcane .The day the sugarcane tasted bitter, he knew the time had come to shed his body. He instructed the urchins playing in Tiruvottiyr beach, Chennai to cover him with a big heating vessel used by washeremn to perform a magic feat. The children shut him with the vessel and when they opened up, there was a Siva Lingam instead of Pattinathar in human form. Now, are you satisfied ? Arcsekar, I am not looking for satisfaction but truth although relative. When I asked in earnest Are you satisfied- I meant are you convinced. I know for sure looking for Truth in this forum is not the means and method and that you should do Self enquiry to find Truth.. Again, why dilute Truth from absolute level to relative level. In the acknowledgement , you reveal your are more egocentric than truth oriented. In the acknowledgement , you reveal your are more egocentric than truth oriented. Are you and everyone of us not too? Because for the Self there is no individual, karma, even the description sat-chit-ananda, Atman, Brahman. The Self doesn't need atma-vichara too. The Self doesn't need teachings, methods and so on. Everything is for the ego. You say "I am the Self". Are you know that or you just believe it? If you know it you are a jnani and you will not need atma-vichara. Only jnani can say "I am Atma". We just can say "I believe I am Atma because I believe in the words of my Guru and God Himself". So consciously or not you, I and all of us are ego orientated. If we were not, we would be free and there wouldn't be "others" with which to speak. from Sethu to Himalayas? Are they not Jnanis? Devotee:- then Jnanis also do have prarabdha? knows everything. Jnanis are the Self. I feel, we need to be clear what we really mean when we refer "Karma" Does it mean "endurance" or "bodily acts" of Jnani. If it is a mater of endurance, a Jnani does not endure. He is devoid of Pain or Pleasure, They are all just the same experiences of Self alone. They don't have any experience other than Self. Even to say "Experience" is really not correct, as there is no experience also really! If it is a question of Bodily acts, then too, a jnani is not bound by body, it has been seen in every saints life that the body is just an inert 'thing' which is at complete control of the Jnani, i.e. the jnani is not bound by the body like us! If we take Sadasiva Brahmendra, when his hands were cut off, he was not even aware, when somebody saw that and pointed this to Sadasiva Brahmendra, he simply went back and fixed his hands back. Even Shirdi Sai Baba is said to have practiced Khanda Yoga, where in, he removed his limbs, and placed them separately and fixed them back! Moreover, Prarabhda means, happenings bound by past karma, but a Jnani is not bound by any karma, basically, We could perhaps closely only say that His Will itself is His Karma! He uses the Body so long He Wills. Look into the life of Bheeshma, MahaBharatha, He had the power to live in his body till He Willed! Moreover, Bhaagavan's words and other Saint's words and responses, can never be generalised! they are case specific, questioner specific and we can surely see contradition to same responses by Jnanis. If we observe carefully, from ordinary eye, even in Bhaagavad Gita, we can see so many contradiction in Krishnas responses. Ultimately, it goes beyond doubt that a "Jnani" cannot be FIT into our definition or our understanding. hence, what ever, we know, still is not That! For That is not an object of knowing, experiencing! There is no way of finding out, but by just becoming one, or being one! Question: Is it posssible to overcome, even while the body exists, the Prarabdha Karma which is said to last till the end of the body? Sri Ramana Maharshi: Yes. If the agent, upon whom the Karma depends, namely the ego, which has come into existence between the body and the Self, merges in its source and loses its form, how can the Karma, which depends upon it, survive? When there is no â€˜Iâ€™ there is no Karma. Question: It is said that Prarabdha Karma is only a small fraction of the Karma accumulated from previous lives. Is this true? 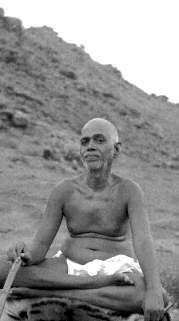 Sri Ramana Maharshi: A man might have performed many Karmas in his previous births. A few of these alone will be chosen for this birth and he will have to enjoy their fruits in this birth. It is something like a slide show where the projectionist picks a few slides to be exhibited at a performance; the remaining slides being reserved for another performance. All this Karma can be destroyed by acquiring knowledge of the Self. The different Karmas are the slides, Karmas being the result of past experiences, and the mind is the projector. The projector must be destroyed so that there will be no further reflection and no further births and no deaths. Question: Who is the projectionist? What is the mechanism, which selects a small portion of the Sanchita Karma and then decides that it shall be experienced as Prarabdha Karma? Sri Ramana Mahrshi: Individuals have to suffer their Karmas but Iswara manages to make the best of their Karmas for his purpose. God manipulates the fruits of Karma but he does not add or take away from it. The subconscious of man is a warehouse of good and bad Karma. Iswara chooses from this warehouse what he sees will best suit the spiritual evolution at the time of each man, whether pleasant or painful. Thus there is nothing arbitrary. Question: In â€˜Upadesa Saram', you say that Karma bears fruit by the ordinance of God (Karta). Does this mean that we reap the consequences of Karma solely because God wills it? Sri Ramana Maharshi: In this verse Karta (God) means Iswara. He is the one who distributes the fruits of actions to each person according to his Karma. That means that he is the manifest Brahman. The real Brahman is unmanifest and without motion. It is only the manifest Brahman that is named as Iswara. He gives the fruit to each person according to his actions (Karma). That means that Iswara is only an agent and that he gives wages according to the labour done. That is all. Without this Sakti (power) of Iswara, this Karma would not take place. That is why Karma is said to be on its own, inert. Questioner: The present experiences are the result of past Karma. If we know the mistakes committed before, we can rectify them. Sri Ramana Maharshi: If one mistake is rectified there yet remains the whole Sanchita Karma from former births which is going to give you innumerable births. So that is not the procedure. The more you prune a plant, the more vigorously it grows. The more you rectify your Karma, the more it accumulates. Find the root of Karma and cut it off. Question: Does the Karma theory mean that the world is the result of action and reaction? If so, action and reaction of what? Sri Ramana Maharshi: Until realisation there will be Karma, that is action and reaction. After realisation there will be no Karma and no world. Question: If I am not the body why am I responsible for the consequences of my good and bad actions? Sri Ramana Maharshi: If you are not the body and do not have the idea â€˜I am the doerâ€™, the consequences of your good or bad actions will not affect you. Why do you say about the actions the body performs â€˜I do thisâ€™ or â€˜I did thatâ€™? As long as you identify yourself with the body like that you are affected by the consequences of the actions, that is to say, while you identify with the body you accumulate good and bad Karma. Questioner: But since I am not the body I am not really responsible for the consequences of good or bad actions. Sri Ramana Maharshi: If you are not, why do you bother about the question? Questioner: In some places it is stated that human effort is the source of all strength and that it can even transcend Karma. In others it is said that it is all divine grace. It is not clear which of them is correct. Debates such as this are mere arguments, which can never arrive at the final truth. That is why I say first find out who you are. If one asks, â€˜Who am I? How did I get this Dosha (fault) of life?â€™, the â€˜Iâ€™ will subside and one will realise the Self. If one does this properly the idea of Dosha will be eliminated and peace will be obtained. Why even obtained? The Self remains as it is. The essence of Karma is to know the truth of oneself by enquiring â€˜Who am I, the doer, who begins to do Karmas?â€™ Unless the doer of Karmas, the ego, is annihilated through enquiry, the perfect peace of supreme bliss, which is the result of Karma Yoga, cannot be achieved. Question: Can people wipe out the consequences of their bad actions by doing Mantras or Japa (repeating Godâ€™s name) or will they necessarily have to experience them? Sri Ramana Maharshi: If the feeling â€˜I am doing Japaâ€™ is not there, the bad actions committed by a man will not stick to him. If the feeling â€˜I am doing the Japaâ€™ is there, the consequences of bad actions will persist. Question: Does the Punya (merit accumulated from virtuous acts) extinguish Papa (demerit accumulated from sinful acts)? Sri Ramana Maharshi: So long as the feeling â€˜I am doingâ€™ is there, one must experience the result of oneâ€™s acts, whether they are good or bad. How is it possible to wipe out one act with another? When the feeling that â€˜I am doingâ€™ is lost, nothing affects a man. Unless one realises the Self, the feeling â€˜I am doingâ€™ will never vanish. For one who realises the Self where is the need for Japa? Where is the need for Tapas (austerity)? Owing to the force of Prarabdha life goes on, but he who has realised the Self does not wish for anything. Prarabdha Karma is of three categories, Ichha, Anichha and Parechha (personally desired, without desire and due to others' desire). For the one who has realised the Self, there is no Ichha-Prarabdha but the two others, Anichha and Parechha, remain. Whatever a Jnani (Self-realised) does is for others only. If there are things to be done by him for others, he does them but the results do not affect him. Whatever be the actions that such people do, there is no Punya and no Papa attached to them. But they do only what is proper according to the accepted standard of the world â€“ nothing else. Those who know that what is to be experienced by them in this life is only what is already destined in their Prarabdha will never feel perturbed about what is to be experienced. Know that all oneâ€™s experiences will be thrust upon one whether one wills them or not. Question: The realised man has no further Karma. He is not bound by his Karma. Why should he still remain within his body? Sri Ramana Maharshi: Who asks this question? Is it the realised man or the Ajnani (ignorant)? Why should you bother what the Jnani (Self-realised) does or why he does anything? Look after yourself. You are now under the impression you are the body and so you think that the Jnani also has a body. Does the Jnani say he has a body? He may look to you as if he has a body and he may appear to be doing things with the body, as others do, but he himself knows that he is bodiless. The burnt rope still looks like a rope, but it canâ€™t serve as a rope if you try to bind anything with it. A Jnani is like that â€“ he may look like other people, but this is only an outer appearance. So long as one identifies oneself with the body, all this is difficult to understand. That is why it is sometimes said in reply to such questions, â€˜The body of the Jnani will continue till the force of Prarabdha works itself out, and after the Prarabdha is exhausted it will drop offâ€™. An illustration made use of in this connection is that of an arrow already discharged which will continue to advance and strike its target. But the truth is the Jnani has transcended all Karmas, including the Prarabdha Karma, and he is not bound by the body or its Karmas. Not even an iota of Prarabdha exists for those who uninterruptedly attend to space of consciousness, which always shines as â€˜I amâ€™, which is not confined in the vast physical space, and which pervades everywhere without limitations. Such alone is the meaning of the ancient saying, â€˜There is no fate for those who reach or experience the heavensâ€™. Question: If a thing comes to me without any planning or working for it and I enjoy it, will there be no bad consequences from it? Sri Ramana Maharshi: It is not so. Every act must have its consequences. If anything comes your way by reason of Prarabdha, you canâ€™t help it. If you take what comes, without any special attachment, and without any desire for more of it or for a repetition of it, it will not harm you by leading to further births. On the other hand, if you enjoy it with great attachment and naturally desire for more of it, it is bound to lead to more and more births. Question: According to the astrological science, predictions are made about coming events taking into account the influence of the stars. Is that true? Sri Ramana Maharshi: So long as you have the feeling of egotism all that is true. When the egotism is destroyed, even if they appear to see they do not really see. Destiny is the result of past action. It concerns the body. Let the body act as may suit it. Why are you concerned with it? Why do you pay attention to it? Should anything happen, it happens as the result of oneâ€™s past actions, of divine will and of other factors. Question: The present is said to be due to past Karma. Can we transcend the past Karma by our free will now? Sri Ramana Maharshi: See what the present is. If you do this you will understand what is affected by or has a past or a future, what is ever-present and always free and what remains unaffected by the past or future or by any past Karma. Question: Is there such a thing as free will? Sri Ramana Maharshi: Whose will is it? So long as there is the sense of doership, there is the sense of enjoyment and of individual will. But if this sense is lost through the practice of Vichara (self-enquiry), the divine will will act and guide the course of events. Fate is overcome by Jnana, Self-knowledge, which is beyond will and fate. Question: I can understand that the outstanding events in a manâ€™s life, such as his country, nationality, family, career or profession, marriage, death, etc., are all predestined by his Karma, but can it be that all the details of his life, down to the minutest, have already been determined? Now, for instance, I put this fan that is in my hand down on the floor here. Can it be that it was already decided that on such and such a day, at such and such an hour, I should move the fan like this and put it down here? Sri Ramana Maharshi: Certainly. Whatever this body is to do and whatever experiences it is to pass through was already decided when it came into existence. Question: What becomes then of manâ€™s freedom and responsibility for his actions? Sri Ramana Maharshi: The only freedom man has is to strive for and acquire the Jnana (knowledge) which will enable him not to identify himself with the body. The body will go through the actions rendered inevitable by Prarabdha and a man is free either to identify himself with the body and be attached to the fruits of its actions or to be detached from it and be a mere witness of its activities. Question: So free will is a myth? Sri Ramana Maharshi: Free will holds the field in association with individuality. As long as individuality lasts there is free will. All the scriptures are based on this fact and they advise directing the free will in the right channel. Find out to whom free will or destiny matters. Find out where they come from, and abide in their source. If you do this, both of them are transcended. That is the only purpose of discussing these questions. To whom do these questions arise? Find out and be at peace. Question: If what is destined to happen will happen, is there any use in prayer or effort or should we just remain idle? Sri Ramana Maharshi: There are only two ways to conquer destiny or be independent of it. One is to enquire for whom is this destiny and discover that only the ego is bound by destiny and not the Self, and that the ego is non-existent. The other way is to kill the ego by completely surrendering to the Lord, by realising oneâ€™s helplessness and saying all the time, â€˜Not I but Thou, O Lordâ€™, giving up all sense of "I" and â€˜mineâ€™ and leaving it to the Lord to do what He likes with you. Surrender can never be regarded as complete so long as the devotee wants this or that from the Lord. True surrender is love of God for the sake of love and nothing else, not even for the sake of liberation. In other words, complete effacement of the ego is necessary to conquer destiny, whether you achieve this effacement through self-enquiry or through Bhakti Marga (path of devotion). Thank you, Nagaraj! That was more than helpful! Very nice explanation nagaaj garu. BTW, i am india and currently in hyderabad and bhagavan willing i should be visiting ramana ashramam in 2 weeks.